Let me state at the outset that I think this is one of the most important books ever written. I had this book on my shelf of unread books for a long time. I had actually tried to start it once but put it down as I did not feel ready to read it and for that I’m grateful. In some circles it is held to be controversial but as far as I am concerned the skeptics, well….I think they are fools. The premise of the book is that human kind has been writing things down and counting things for a very long time…maybe as long as 200,000 years or more. That’s what a lot of scholars have a hard time accepting, especially since the standard line is that counting and writing did not start until about 5000 years ago in ancient Mesopotamia. 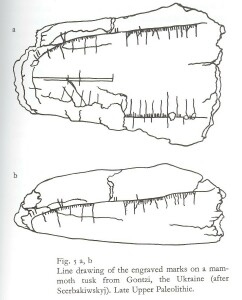 The proof presented is a large and varied sample of artifacts. 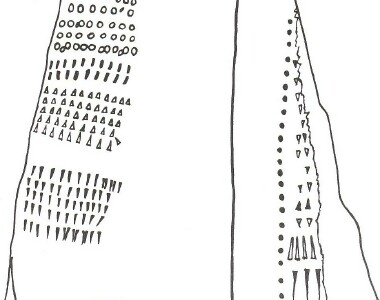 bones, stones and drawings. The reasoning behind the conclusion is the result of a meticulous and detailed examination of these objects, usually under a high-power microscope. It’s a funny thing perhaps, may even sound a bit arrogant, but I find myself somewhat uniquely qualified to speak to this subject because I am probably one of a very few persons who has actually done this type of work. My experience has given me a personal, real and tactile sense of how one evaluates such material in this way. You see, I am a Philatelist, better known as a Stamp Collector. In the course on decades of work with my stamps collection, I developed an deep interest and some small skill at the detailed examination of the minute variations that exist on Postage Stamps. In the field it has been given the title “Fly-Speck Collecting”. As the name implies, the interest is in something quite small…a speck…a tiny bit of difference between one stamp and another. In today’s world of mass-production, a typical new U.S. stamp might be printed 100,000,000 times. In the early days, a typical issue might only be issued with 250,000 copies, many times much less. In addition, the printing process was all manual and every issue was hand engraved on a steel master. The single master copy was hand transferred to a printing plate which might hold 25, 40, 50 or 100 identical copies of the original master. From this plate, the sheets of stamps were printed. When a human does the same task 100 times, there is always the possibility of a slip or some minor variation in the transfer pressure or angle at which the original was “rocked in”. 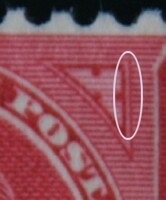 Any such occurrence is reflected in the final product and may yield a situation where one stamp in a sheet of 100 is slightly different from the rest. Collectors notice such things…at least some of them. In addition, the plates wear during the printing process. Over time, the images get a bit fainter over time as the metal thins. 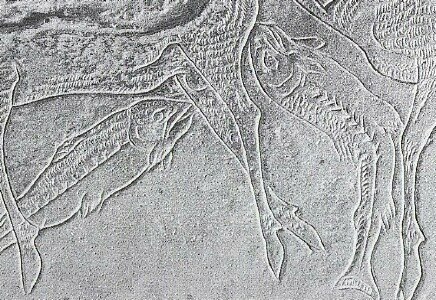 If the plate is used long enough, the printers decide that some repair work is required and an engraver does some “touch up” work on the weakest copies. These modifications may be significant enough to also be noticeable. Finally, plates can get damaged. 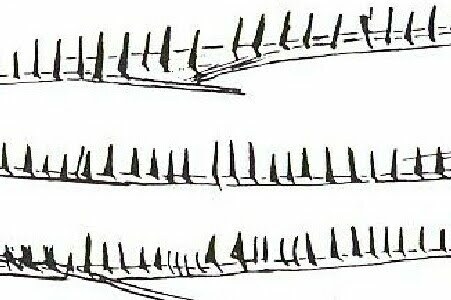 If they are not fired and treated properly, they will crack, causing new lines to appear where there were none. 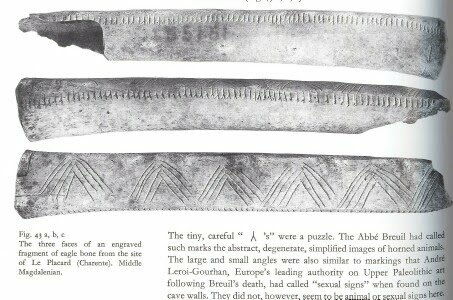 There are also known cases where tools were dropped on the plates, leaving scars and damage. For those of us who cared about such things, these are highly collectible, or at least at one time they once were. Today the interest has died off due to the sheer volumn of the new stamps. Remember that I mentioned that at times when a plate of stamps got worn, that an engraver would “retouch” the weak parts of the image, well, this is an example of that….look closely at the 3 enhanced hairs…. 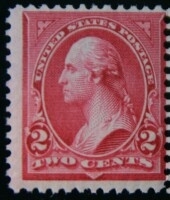 The first example is a normal stamp. The second has a single “recut” in the upper left. 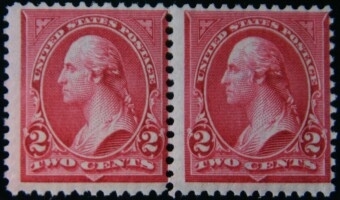 The third has 3 “recuts”. 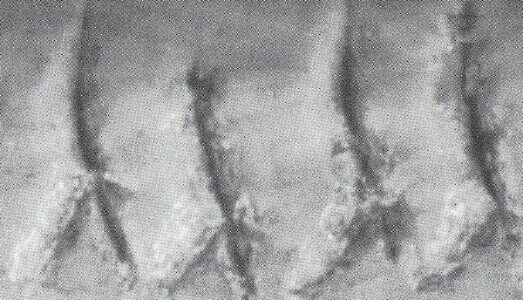 The 4th copy is an example of what is called a “double transfer”, meaning that the image was not laid down properly by the engraver…a slip of the hand. The next shows a crack in a plate. The next 2 show 2 “recuts” and the final shows a “gash”, thought to result from a dropped tool. Now, I did this for a very specific reason…not just to show off some of my neater stamps….I did not come by these stamps by spending a lot of money on them. Only one of these was actually purchased – the cracked stamp, which is actually the finest example in US stamps. The others were found the hard way….I bought thousands and I mean thousands of samples of this stamp and others and examined them under magnification, one by one. For the better part of a decade, this is what I did in my spare time. At one time I estimated that I had bought something like 100,000 stamps in bulk lots and checked all of them. 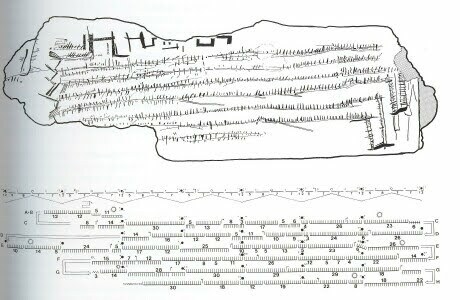 I find this of particular interest because it has always seemed incorrect, even highly arrogant, to assume, as most historians seem to assume, that civilization begins with the first formal system of writing and that this first took place in Mesopotamia about 5000-6000 years ago. While the folks who left us the cave drawings in places like Lascoux did not leave behind any literary works, it is hard for me to see them as “uncivilized”. It seems like such a modern conceit. Finally there are the eclipses. 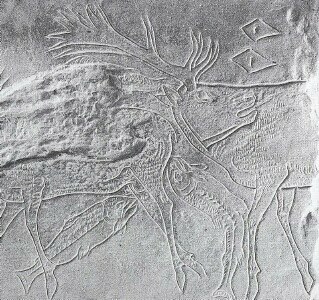 We know that they could be predicted by the ancients. How long did they have to make observations and keep records in order to recognize a pattern of events that occurred in odd frequencies of years: 22, 46 etc. For instance, Halley’s comet has been returning to the night sky every 75-76 years for a very long time. Yet its period of return was not recognized until its return in 1756 was accurately predicted. 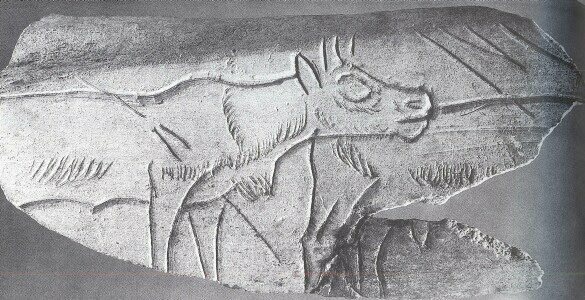 Records of its appearance go back at least to 240BC. “A science writer, Marshack had been hired by the National Aeronautics and Space Administration to produce an account of how humankind had come to the threshold of a lunar landing. 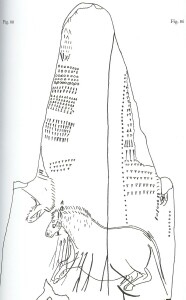 Marshack found several pages of the first chapter, in which he proposed to trace the origin of humanity’s interest in the moon, impossible to write because of, as he put it, all the “suddenlies” concerning the appearance in the archaeological record–from Sumer, Egypt, and India–of sophisticated solar-lunar-stellar calendars related to agriculture. To his way of thinking, these achievements implied millennia of preparation. The only generalization Marshack was able to extract from his survey of the literature was that behind all these calendric systems lay an earlier calendric tradition based on lunar cycles. 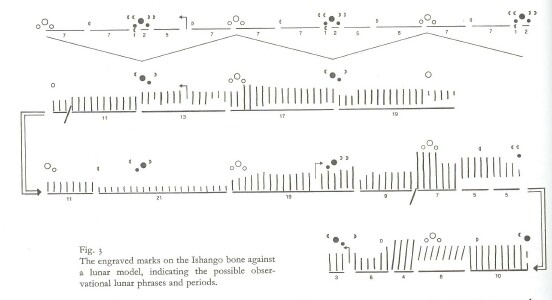 Under the pressure of a deadline, and unable to write a satisfactory first chapter, Marshack picked up at random an article from Scientific American about a bone with incised scratches from Ishango, at the headwaters of the Nile, dating from about 6500 B.C. 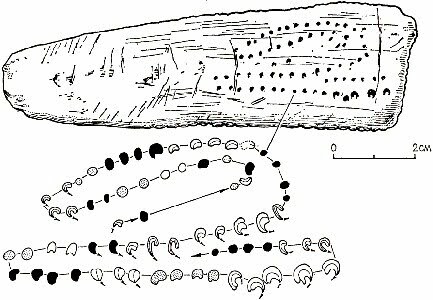 The author of the article concluded that the scratches probably represented “an arithmetical game,” perhaps having to do with multiplying by two. Finding this explanation unsatisfactory, because it implied no purpose for the markings, Marshack was struck by the thought that these scratches must represent some sort of notation, some sort of “storied meaning.” Following this line of thought, he pushed the NASA moon manuscript to one side, and decided to see if the pattern of scratches bore any resemblance to lunar periods. Within fifteen minutes he came to see that it was possible that his hypothesis was correct, and that it was impossible to rule it out. 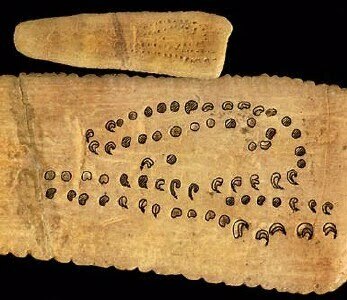 This is one of the clearest examples of a calendar associated with the phases of the moon. 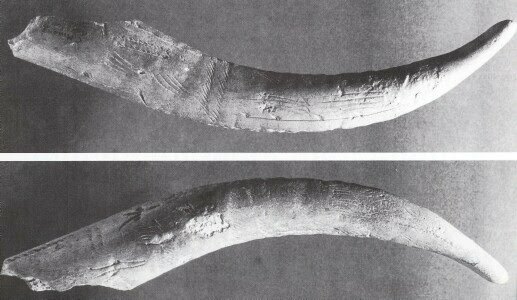 This bit of a bone has been dated to 20,000 – 25,000 years ago. 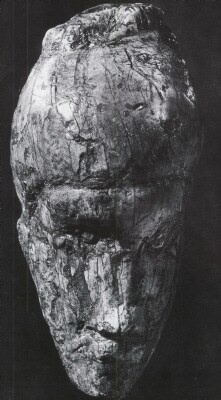 It was found in Africa and is known as the Ishango Tool. This has to be one of the greatest masterpieces we have managed to find.